Any FPS being released at the moment is taking a risk by coming out in the shadow of Killzone 2 and its unstoppable hype machine, but F.E.A.R. 2, which I’ll hereafter refer to as Project Origin for the sake of my sanity, has been getting some praise of its own. It even controversially scored higher than Killzone in the latest issue of Edge, which has caused consternation in some circles. When my copy arrived, I must admit that my first impressions were slightly underwhelming. 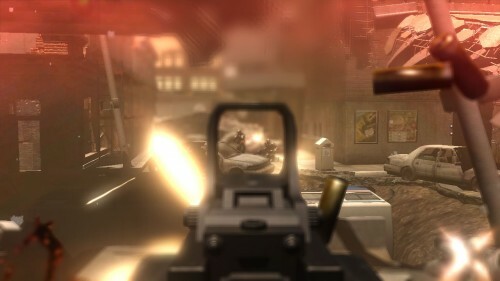 The first ‘interval’ – that’s ‘mission’ to you and me – takes place in a plush office block and has you fighting your way to the top against some generic special forces guys with a basic SMG and no sign of the game’s standard bullet time feature, and even the scary horror flashes toned down from how it bashed you over the head with them in the early stages of F.E.A.R. It’s really nothing more than a prologue, though, which becomes apparent when it ends in the wake of the first game’s finale. Once you’re playing Project Origin proper, special abilities and all, it gets much more interesting. In the first few chapters after the prologue you get more variety of enemies – including my favourite: a trooper with a gas tank on his back that will make him blow up in a puff of smoke and giblets if you shoot it – and the scares come in, mostly consisting of apparitions and random psychic attacks on you and your enemies, with sneak attacks from a new kind of baddie that I won’t spoil coming in later. It gets quite creative: at one point you’ll see an enemy get pulled around a corner by an unseen force, swiftly followed by his liquified remains. Rounding the corner, all you can see of him is his head, spinning around in an industrial washing machine. While there’s nothing in terms of environments that you won’t have seen before, it’s thankfully far more varied than the first game’s much-derided office-warehouse-office formula. There’s everything from plush apartments to ruined city streets, a high school – I’m slightly surprised that made it in – and yes, warehouses and offices. There is, after all, only so much that you can do in terms of setting with a first-person shooter in an urban centre, but the devastation around you makes things more interesting than you’d think. Little things like the humans turned to ash on the streets, which crumble into dust if you touch or shoot them, and the parts of a plane whose crash you witness give personality and back story to what could be dull areas. 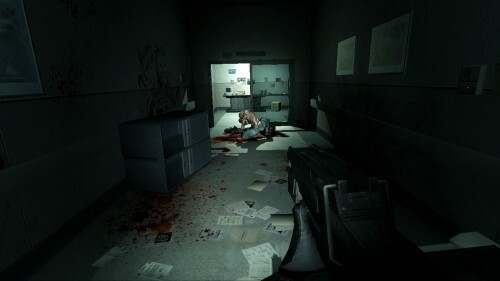 It’s helped by some excellent horror imagery, mercifully used with enough restraint to not be overbearing and to enhance rather than detract from the action, whether it’s by surprising you with a psychic episode or simply playing the environs to freak you out – the rattling lockers, seen in the demo, remain a favourite of mine. It might not be as outright scary as the first one, but it stays just the right side of the action/horror divide for me, allowing them to complement each other nicely. If I had any complaint it’s that the game is slightly on the easy side, so playing on hard may be something to consider. Even on the default setting it’s a reasonable length for a game of this type, but if you like a challenge and expect to die more than a couple of times – to be expected given the same aggressive, tactical enemy AI as the original – it’ll help you get more out of it. It may risk suffering simply for not being Killzone 2, but I thoroughly enjoyed playing through F.E.A.R. 2. What on earth was that ending about, though?